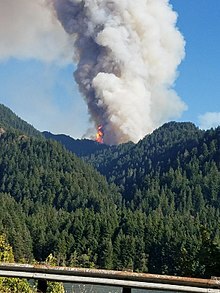 The Eagle Creek Fire was a destructive wildfire in the Columbia River Gorge in the U.S. states of Oregon and Washington. The fire was started on September 2, 2017, by a 15-year-old boy igniting fireworks during a burn ban. The fire burned 50,000 acres, and burned for three months, before being declared completely contained. As of May 29, 2018 it was found still smoldering in some areas. In mid-September 2017, highway closures and local evacuations were gradually being lifted. By September 28, 2017, the fire had consumed 48,831 acres (19,761 ha) and was 46% contained. In late October, fire growth was slowed by rain. On November 30, 2017, the fire was declared fully contained but not yet completely out. As of August 2018, the Historic Columbia River Highway remains closed from Bridal Veil to Ainsworth State Park, a section providing access to many popular scenic destinations such as Multnomah Falls. On September 5, Oregon State Police announced that it had identified the person suspected of starting the wildfire, through the use of fireworks that were illegally set off, as a 15-year-old boy from Vancouver, Washington. A witness reported seeing a group of teenagers recording the fireworks being lit and thrown into Eagle Creek Canyon. It was announced on September 8 that Oregon State Police had obtained cellphone video footage from one of the teenagers who had watched while a 15-year-old Vancouver boy threw a smoking firecracker, allegedly igniting the Eagle Creek Fire. Public Information Officer Capt. Bill Fugate says "the video will be released through the public records request process once the investigation is closed and the case is adjudicated, if charges are filed", reported Willamette Week. The teen was sentenced in February 2018 to five years of probation and 1,920 hours of community service with the U.S. Forest Service. He also was ordered to write apology letters to 152 people trapped on the Eagle Creek trail because of the spreading flames, the city of Cascade Locks, the Forest Service, Oregon State Parks, the Oregon Department of Transportation, the Confederated Tribes of Warm Springs, the Columbia River Intertribal Fish Commission and many others. On May 21, 2018, a judge ordered the 15-year old to pay more than $36 million in restitution, which includes more than $21 million on behalf of the U.S. Forest Service, $12.5 million to the Oregon Department of Transportation, more than $1.6 million to the Oregon State Fire Marshal, more than $1 million to Union Pacific Railroad and varying amounts to Oregon State Parks, Allstate Insurance and a woman who lost her home in the fire. In his sentencing, Judge John A Olsen stated that the terms of the repayment were for a payment plan lasting for ten years, provided that the offender completed five years of probation and did not commit any crimes in the ten-year period. Trees along Interstate 84, near Cascade Locks, show burnt bark in June 2018. The Eagle Creek Fire was reported on September 2 at 4:00 PM in the Columbia River Gorge. By the morning of September 3, the fire had grown to 3,000 acres (1,200 ha). On September 5, the fire hopped over the Columbia River into Washington state, near Archer Mountain. The fire trapped 153 hikers and forced them to stay overnight six miles up the trail, trapped on the other side by the Indian Creek Fire. The first rescuer, a Forest Service ranger named Sharon, reached the hikers around 10 p.m. An attempt to drop supplies to the hikers, and to airlift out the youngest children, was aborted because the narrow terrain and night made the maneuver too hazardous. The hikers—who generally had been on a hot summer day hike—huddled together and tried to sleep on the bare ground while the sky glowed red. Several additional staff from the Forest Service arrived overnight with welcome space blankets and some provisions. The next morning, Pacific Northwest Search and Rescue, along with Mountain Wave Search and Rescue, escorted the hikers out to Wahtum Lake and bussed them back to the Eagle Creek Trailhead. The community of Cascade Locks, Oregon was the first to experience mandatory evacuations, with 283 structures, including 15 businesses, being threatened by the fire. Salmon hatcheries at Cascade Locks were forced to release 600,000 fish six months earlier than expected. The fire also threatened historic structures in the Eagle Creek Day Use Area, specifically those built by the Civilian Conservation Corps in the 1930s. 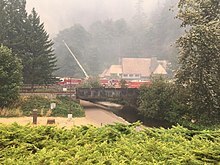 The fire also threatened the Multnomah Falls Lodge, which was saved by water tenders. As of September 27, the Eagle Creek Fire had burned 48,665 acres (197 km2) and was 46% contained. Rainfall during previous days had significantly contained and newly downgraded the fire. The Incident Command Post was relocated from Hood River County Fairgrounds to the Best Western Columbia River Inn in Cascade Locks. In the early hours of September 6, the Eagle Creek Fire merged with the Indian Creek Fire. Fire officials estimated that, together, over 31,000 acres were actively burning. The gorge still looks like the gorge... It's not a wasteland. It's not a blackened, destroyed no-man's land. There are trees everywhere and they look good... That's not to say there isn't damage to some of those trees... But, it's still a beautiful drive through there and it still looks good. The following day, September 7, circumstances led Simmons to update his statement to "There is significant damage to the trails... it's going to take a while for them to recover." Westward winds blew smoke and up to one inch of ash on the Portland metro area during 4 and 5 September. Air quality was officially reduced to an "unhealthy" rating due to smoke and falling ash, forcing many schools to close or cancel outdoor activities. On Friday, September 15, smoky conditions resumed throughout the Portland Metro area, accompanied by far less falling ash than previously, but downgrading air quality to an "unhealthy" rating again on Saturday, 16 September. Shifting wind conditions and subsequent rain on Sunday, September 17 cleared skies and aided in fire containment. 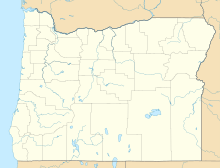 Cascade Locks, Oregon was the first area of mandatory evacuation. As of September 5, a number of communities in the area were added to mandatory evacuation. In Multnomah County, mandatory evacuation orders were in place for Larch Mountain, and the communities of Latourell, Bridal Veil, Dodson, Warrendale, and East Corbett. "Get Set" evacuations were in place for Corbett and Springdale. An evacuation shelter was established at Mt. Hood Community College. The Columbia River itself was also closed to all marine traffic for 20 miles, from mile marker 126 to 146. The I-84 corridor from Troutdale, Oregon to Hood River, Oregon, continued to be an active evacuation zone as of September 12. "Eastbound I-84 will remain closed at least another week for rock and tree removal. However, ODOT plans to open the Westbound lanes of I-84 first. Meanwhile, the Historic Columbia River Highway remains closed with no schedule to reopen. Rocks and trees continue to fall and ODOT is working to keep the highway available for firefighters. ODOT has removed about 2,000 trees that were in danger of falling onto I-84, but there are about 1,500 trees that crews still need to remove. ODOT hopes to complete that tree removal by early next week. The biggest danger to drivers is the threat of falling rocks, most of them around the Toothrock Tunnel. The work to make this area safe is slow. ODOT has inspected 70 bridges and culverts along I-84 and found minimal damage." A total of 400 residences were under mandatory evacuation notices. In Hood River County, mandatory evacuations are in place for all areas south of Interstate 84 in Cascade Locks. The rest of Cascade Locks was at "Get Set" evacuation level on September 5. Meanwhile, in Skamania County, Washington, there were mandatory evacuations for Archer Mountain Road, Smith Crops and Deville Road. Mabee Mines Road was also at a "Get Set" evacuation level at that time. As of September 9, 2017, the Oregon State Fire Marshal (OSFM) task force was on alert for potential evacuation of Lost Lake and Mitchell Point. On November 3, 2017, the U.S. Forest Service listed an "Estimated Containment Date" for the Eagle Creek Fire of November 30. On November 30, 2017, the fire was declared 100 percent contained but not yet completely out. ^ a b c d e f "Eagle Creek Fire". Eagle Creek Fire. U.S. Forest Service. Retrieved September 5, 2017. ^ a b Woolington, Rebecca (September 3, 2017). "Eagle Creek fire was likely caused by fireworks; hikers evacuated". The Oregonian. Retrieved December 5, 2017. ^ a b Brosseau, Carli (September 5, 2017). "Fire Burning in the Columbia". The Oregonian. Retrieved December 5, 2017. ^ a b Eltagouri, Marwa (May 22, 2018). "Teen who started massive Oregon wildfire with fireworks must pay $36 million, judge rules". Washington Post. ISSN 0190-8286. Retrieved May 22, 2018. ^ a b c Ryan, Jim (November 30, 2017). "Columbia Gorge fire declared 100 percent contained; hot spots still possible". The Oregonian. Retrieved December 5, 2017. ^ "Level 3 Eagle Creek fire evacuation order lowered to Level 2". The Oregonian. September 15, 2017. Retrieved December 5, 2017. ^ "Eagle Creek Fire Daily Update 9/28/17". InciWeb. September 28, 2017. Retrieved May 24, 2018. ^ Griffin, Anna; Wilson, Conrad (September 5, 2017). "Eagle Creek Fire Witness: Young Hikers Giggled As Firecracker Descended Into Gorge Canyon". Oregon Public Broadcasting. Retrieved September 6, 2017. ^ Green, Aimee (September 5, 2017). "Witness: Teens giggled as they threw fireworks off cliff, igniting Eagle Creek fire". The Oregonian. Retrieved September 5, 2017. ^ Shepherd, Katie (September 8, 2017). "Oregon State Police Obtained Cellphone Video From Firecracker-Throwing Teens Suspected of Starting the Columbia River Gorge Fire". Willamette Week. Retrieved December 5, 2017. ^ Embury-Dennis, Tom (May 21, 2018). "Teenager who started massive Oregon wildfire ordered to pay $37 million". The Independent. ISSN 0951-9467. Retrieved May 22, 2018. ^ "Eagle Creek Fire". InciWeb. U.S. Forest Service. Retrieved September 5, 2017. ^ Theen, Andrew (September 5, 2017). "Eagle Creek fire: Ash-filled hatcheries force early release of 600,000 salmon". The Oregonian. Retrieved September 6, 2017. ^ "Eagle Creek Fire - Morning Update, September 4, 2017". InciWeb. Retrieved September 6, 2017. ^ "Eagle Creek Fire". InciWeb. U.S. Forest Service. Retrieved September 20, 2017. ^ Crombie, Noelle (September 6, 2017). "Eagle Creek and Indian Creek fires merge; estimated 31,000 acres burning". OregonLive.com/The Oregonian. Retrieved December 5, 2017. ^ Shepherd, Katie (September 5, 2017). "Multnomah Falls Engulfed in Flames as Out-of-Control Wildfire Races West Through Gorge". Willamette Week. Retrieved September 6, 2017. ^ a b "Eagle Creek fire grows, spreads to Washington; officials say fire a 'high priority' in the nation". The Oregonian. September 5, 2017. Retrieved December 5, 2017. ^ Stein, Rosemarie (September 5, 2017). "Portland Tuesday Weather: Dense wildfire smoke causes 'unhealthy' air quality". The Oregonian. Retrieved September 6, 2017. ^ KGW Staff (September 8, 2017). "Portland air quality unhealthy as smoke, ash blow over area". KGW. Retrieved September 6, 2017. ^ KATU News staff (September 5, 2017). "Eagle Creek Fire, air quality and hot weather cause local school closures". KATU. Retrieved September 6, 2017. ^ "Live updates: Eagle Creek fire rages in Columbia gorge, threatens Multnomah Falls Lodge". OregonLive.com. September 5, 2017. Retrieved September 6, 2017. ^ KATU Staff (September 5, 2017). "Eagle Creek fire explodes to 32,000 acres, merges with Indian Creek Fire". KATU. Retrieved September 6, 2017. ^ "Eagle Creek and Indian Creek Fire- Morning Update, September 5, 2017". InciWeb. Retrieved September 6, 2017. ^ Kennelly, Carly (September 11, 2017). "I-84 will stay closed until it is safe to travel". KOIN. Retrieved December 5, 2017. ^ InciWeb: News Release "Eagle Creek Fire - Evening Update 9/9/17"
This page was last edited on 8 April 2019, at 17:00 (UTC).